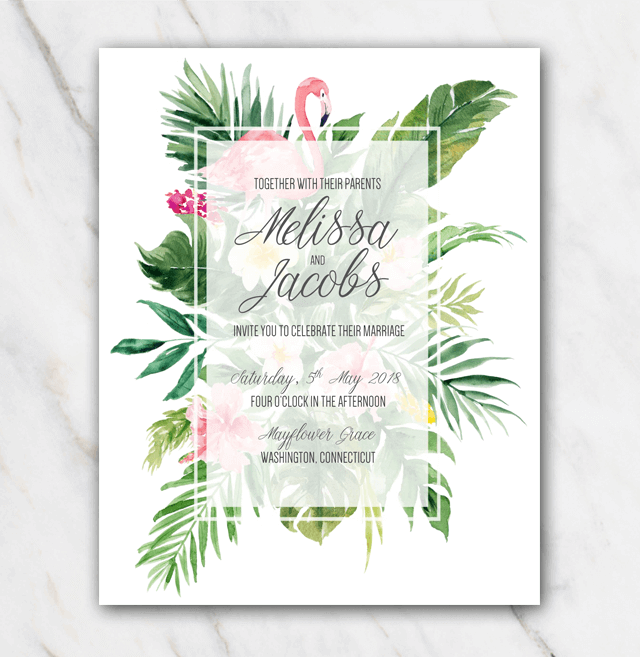 Tropical Flamingo Wedding Invitation Template in Word for FREE! Are you planning a wedding with a summer or tropical theme? Then this template will be perfect for you! The pink and green colors give the invitation a tropical, summer vibe. The different elements like the flamingo, the pink and white flowers and the leaves will send out the right message to your guests about what kind of atmosphere you are looking for during your big day. Just download the template, install the fonts and start editing the information on the invitation. Make sure you don't forget the most important information, like where people should gather at what time. And what about a (summer) dress code? With this easy-to-edit template you will definitely amaze your guests! Looking for something else, for instance a more formal wedding invitation? Check out the other wedding invitation templates.